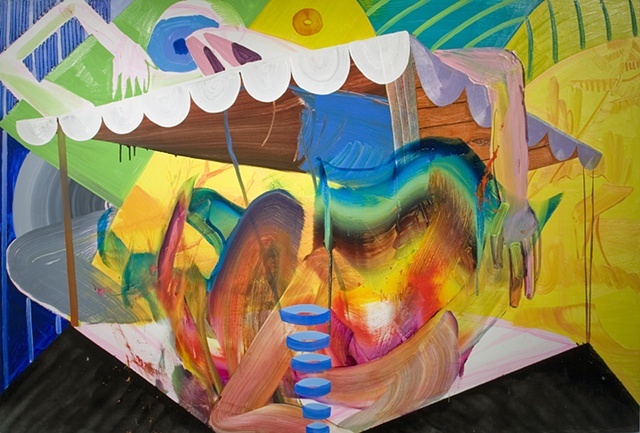 Chicago based Andrew Holmquist’s work puts gestural abstraction and representation together in an exciting way. There’s great wit and invention in the way he suggests three-dimensional space, and simultaneously contradicts it, with big gestural sweeps of paint. De Kooning is a reference point, which immediately jumps out and some of the work brings Dana Schutz’s paintings, exhibited last year at the Douglas Hyde Gallery to mind. Evidently an artist having a lot of fun with the clash of languages of paint, he delights in the substance and its manipulation. His daily series is well worth a look – he set himself the challenge of making at least one small painting a day in addition to his normal practice and these works appear to just start with him pushing paint around, and they look really spontaneous. The ones that work really “pop”. Images from his recent exhibition at the Carrie Secrist gallery here and his own website is here. This entry was posted in Paintings As They Are and tagged Andrew Holmquist on November 1, 2011 by painttube.